How cool would it be to spend the day visiting every ramen-ya that Torrance has to offer? Seriously, I'm talking back-to-back-to-back-to-back-to-back! What? Did you just roll your eyes and call me crazy? Sweet!! I brought up the idea to fellow blogger Exile Kiss shortly after we met up for lunch today around 11:30am. If anyone were crazy enough to do this with me, I knew it would be him. After all, he did shadow my Foo-Foo Challenge with a challenge of his own--mostly doubling up at each sitting to keep pace with my daily visits (impressive indeed). So of course he said "I'm down" and off we were to create some Random Madness of our own on the very first Go Ramen! Run highlighting the city of Torrance and it's 5 main ramen-ya's. Quite possibly the best Sichuan-style ramen-ya on this side of the Pacific, Shisen Ramen's self-titled signature bowl is a mildly-spicy, reddish-clear broth that's an instant classic. Top it with a cutlet of tender Paiko (Fried Pork) and it's the perfect way to start off the day. Some other contents include bok choy, napa cabbage, onion, and a little garlic. The thin noodles with a slight curl had an excellent texture and may have been the best of the entire run, but we'll get to that a little later. Since I've enjoyed the Shisen Ramen on multiple occasions, we decided to also take a stab at the Shoyu Ramen. Unfortunately this was a mistake. Let's just say it tasted like oily soy sauce water without character and definitely without soul. I urge you to stick with the signature ramen because we undoubtedly took-one-for-the-team on this one. I won't even bother listing the toppings. The miniaturized gyoza were also very disappointing. They tasted somewhat chalky and not as good as I remembered. Hopefully it was just a bad day. Anyway, let's get outta here! I ranked Shin Mama Ramen fairly high last year (#4) so I was anxious to see if they still were top 5 worthy. A brief chat with the chef (forgot to get his name) revealed that this ramen-ya has 3 main soup bases: A chicken base that takes 10 hours to prepare, a "regular" shoyu base that takes 8 hours to prepare, and a tonkotsu base that takes 14+ hours to prepare...yikes! Our first choice was the Shinasoba; an intensely flavored explosion that uses the chicken base. My first reaction was WOW! An infusion of pepper with screaming intensity propelled this mildly clear soup. It reminded me of Ichiriki or Harukiya, which in my mind is outstanding. Although it tastes more like Chuuka Soba than Shinasoba, I think Shin Mama's version could hold it's own in Japan--it's that good! My only complaint would be about the noodles. Slippery and missing that comfortable chew, I wouldn't mind if they were replaced. The Kakuni Ramen with the "regular" shoyu base was also quite the standout. The Kakuni was impressive, but it still couldn't woo me like the previous chashu had. The soup wasn't as rich as I remembered and for some reason that bothered me. It had a good flavor, but I couldn't grasp why it had changed so much. The egg had a strong sake taste that reminded me of Okinawa. In the end, I still think Shin Mama is top 5 worthy, but for entirely different reasons. Okay, so the best part of Chabuya was when Exile Kiss ordered hot tea in Japanese and the waitress looked at him like "huh?" Apparently she didn't speak Japanese...hahaha that was hilarious! I first came to this Torrance Chabuya back in January during its pre-Grand Opening so naturally, I wanted to see how it had changed almost a year later. The first ramen we tried was the Tori Soba--an original chicken based broth that contained chicken chashu, fried shallots, and green onions. Honestly, it tasted like chicken soup. You know, the kind from the commercial where the little kid says, "I never knew there was chicken in this soup." Yeah, it was a thicker version of that one. It was...nice. The fried shallots stood out, but it didn't really feel like ramen. The noodles weren't as chewy as I thought they should've been and were eerily similar to the ones we just ate at Shin Mama, only flatter. Could they be using the same factory? "The Classic" with extra chashu was enjoyable, but it had an odd aftertaste. It didn't ruin the ramen, especially since I thought the chashu was outstanding, but it still left me thinking it could have been better. Perhaps the Kara Kara would have filled that void (or just masked it), but no use wondering what could have been, it's time to move on! 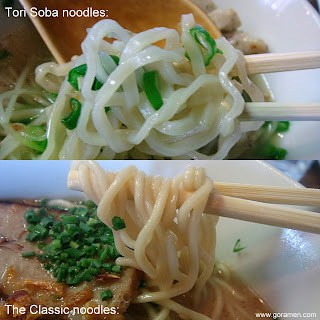 But before we go, let me just show you the difference in noodles for the two ramen. I always admire a ramen-ya that serves more than one type, even if it's not the best. To me, Men-Bei is a classic middle tier ramen-ya that doesn't necessarily have the best ramen, but it's a place where you always feel welcome. Today's visit was nice, but unfortunately I can't say the same about the ramen. Just to mix things up, we ordered the Wonton Ramen with the Shio base and that's really all I have good to say about it. I've enjoyed Men-Bei in the past and it hurts to tell you how horrible this ramen was, but the wonton was purely inedible and the salt-water soup tasted worse than my own sweat--my apologies for the visual. The noodles were more of a positive than negative, but we were ready to head out. Okaike onegaishimasu! Santouka...oh Santouka, please help me understand. The best food court ramen? Definitely! The best ramen in LA? hmm... Okay, let me get this straight. Santouka is good, I like them, especially in Japan, but I just can't grasp it's popularity in LA. Oh well, that's why we are all entitled to our own opinion. This Chibi Shoyu Ramen was the most disappointing of the day. Beginning with an overbearing fishiness and concluding with an overly starchy noodle, there was nothing positive about today's Shoyu. It makes you wonder how a food court ramen actually cooks their soup. Do they cook it elsewhere and deliver it to the market everyday? Or does the health department allow for Santouka to slow cook it within the food court? The Tokusen Toroniku Shio Ramen is by far the best ramen at Santouka. And although it wasn't disastrous like the shoyu, my expectations were looking for something more. Don't get me wrong, the Toroniku is darn good and it's meatiness is admirable, but I still feel like Chabuya's chashu (even if it's a different cut of pork) tastes much better. Santouka's shio base is outstanding, but like Exile Kiss said, it can't really compare to Foo-Foo Tei's remarkable shio. After all they are two different breeds and I'd prefer FFT over this anyday. The noodles were slightly better than the shoyu and surprisingly, the broth was not as piping hot as it normally is. There must have been something wrong because this type of inconsistency is inexcusable. So there you have it. A taste of Torrance ramen in a nutshell. For the record, Gardena Ramen is also technically in Torrance, but we didn't bother with it since both of us had recently gone there with disappointing results. Be on the lookout for Exile Kiss' review. I'm sure he'll have a more descriptive post (like he always does) of our day in Torrance. Until next time, Jaane! Hey E.K. thanks for joining me! It's definitely not something I could've done alone. I was in a rush to get this posted last night so I'm sure I left some details out, but I know that you'll cover it in yours. Looking forward to your post! I've always wanted to try Chabuya since I enjoyed Chabuton in Costa Mesa...except they didn't even last one year. Sorry to hear about Gardena Ramen though, did they really go downhill that much? Haha...thanks edjusted! You must join us for the next run--west la, downtown, gardena, or san diego. It's been rumored in the social club of ramen chef's that GR uses an instant soup for their noodle. It hasn't prevented me from enjoying it, but it does seem like a cardinal sin among ramen-ya's. Plus, E.K. can't handle MSG so we skipped it. That sounds like a load of fun. I don't think I'll be able to keep up with you guys though! Hahaha. Kezio, I'm glad you found a ramen buddy with EK. somehow I always assume EK was a girl =P ... never really bother much to find out who my blogger authors are. 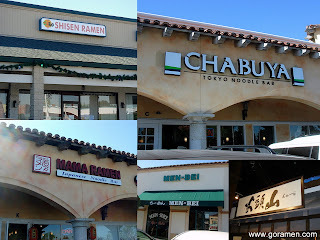 South Bay (Torrance and Gardena) got lot of choices for Japanese cuisine. I'm so jealous of you all! If you included Gardena into your ramen run, I think your stomach would exploded! Hahaha! (sorry didn't mean to laugh so hard) Yes, E.K. is not a girl but he possesses great knowledge about food and was cool to have him as my wingman. (Or was I his wingman?) Nope, I was definitely Maverick this day...haha. Ya I thought about adding Gardena since we were right next door, but that would have meant double and yes my stomach would have exploded. I'm just glad we survived Torrance. Thank you, thank you, thank you. How nice to get the benefit of your wisdom, taste, class and experience!!! It definitely shows, you are a master of this stuff. We've been looking for a good ramen place and you've helped us find it...many thank again! Wow, thank you!! I'm still far from being a master but I'm glad I could help. Thanks again for such kind words...whoever you are. I have to tell you that the Men Bei review was shocking to me. I have eaten there for years now and in my opinion their ramen ranks near the top of my list, certainly above Santouka and Chabuya. Your only mistake was not ordering their most well done ramen, Mabo Ramen. This single ramen dish is what started my love affair with Ramen-Ya restaurants. The Mabo Ramen broth's richness and depth of flavor is unrivaled by any ramen place I have tried yet. It's truly incredible just HOW much flavor it has. Loaded with ground pork and cubes of delicate tofu it is a bowl of ramen that you just can't stop eating. I highly suggest you give them another try, you will thank me. I can also highly recommend their Miso ramen as well, absolutely delicious and rich with flavor. You can't go wrong with either of those. I really enjoyed reading your reviews, keep 'em coming! Hello Chris. I've had the mabo ramen before and agree that it is the best ramen there. I think the key is to never order without msg. I think that why this shio ramen tasted so bland. Anyway, thanks for checking out my blog! Thanks for the reply! I have never had to ask for MSG in anything I have ordered there. Maybe they add it automatically? I'm not sure. Glad to see you have at least tried their Mabo ramen. I really love that place.